Hello! I think we’re finally at the end of the winter tunnel and I am getting more in to slowly buying items for warmer weather. I still haven’t packed away my winter clothes but I am headed south in a few weeks so I’ve been starting to think about my spring / summer wardrobe and what I may be looking to add in to the rotation. I don’t know what it is, but I’ve been a sucker for white jeans lately. 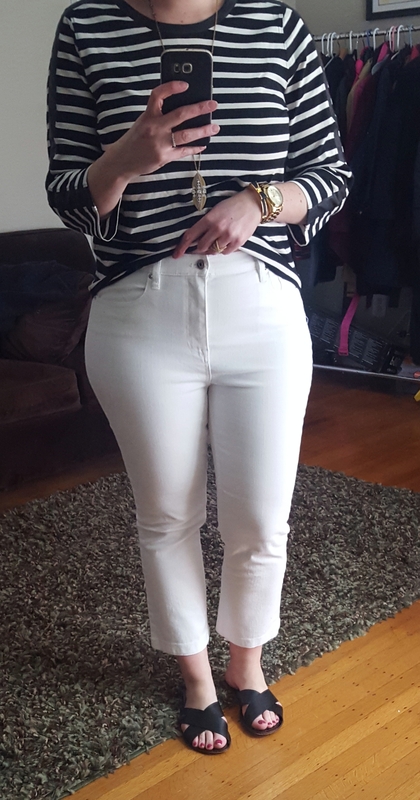 Once I found a pair that I loved (the Ann Taylor Modern Skinny Ankle Jean) I couldn’t get enough. My only thing about them is that they are long and I usually end up cuffing them to get a cropped look. So when I saw the new Billie Demi-Boot Crop Jean in white I thought I’d give it a try. 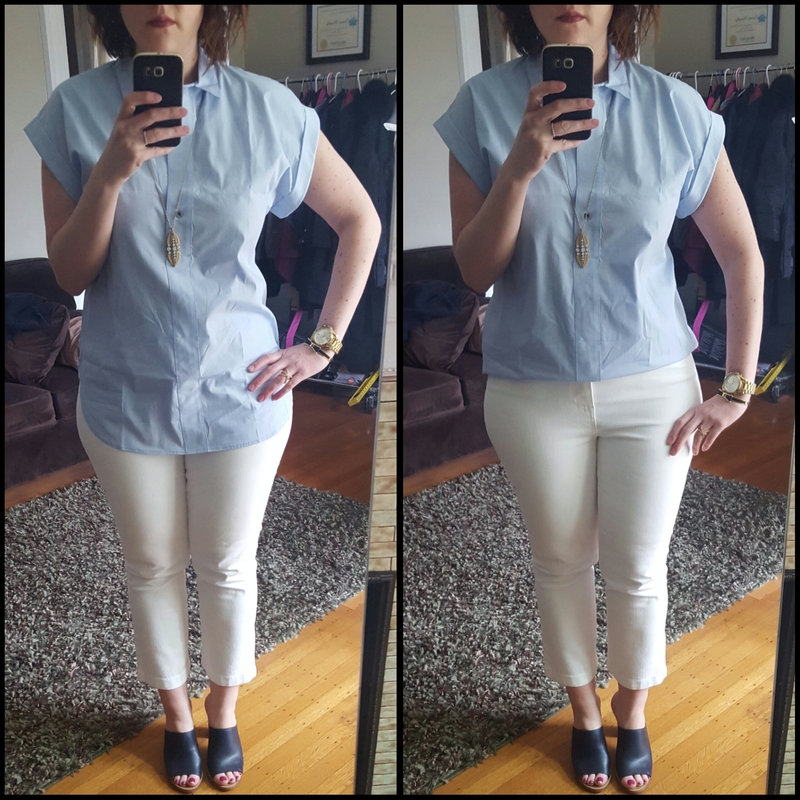 I’ve tried J.Crew’s white jeans in the past and haven’t had luck with them – the fit was never quite right and the cropped ones were always too narrow in the ankle. After seeing them on my friend Andrea over at Tweed and Toile and a recent 30% promotion, I ordered both the regular and the tall length in a size 32 which is my usual J.Crew jean size. I tried the talls on first and I apologize for not including a picture, but they just looked like too-short flared jeans on me. So onward to the regular length ones. The fabric composition on these is 98%/2% elastane and they are lighter weight denim which of course is great for the spring/summer temperatures. I was surprised at how much I liked these on. They didn’t seem like they’d give too much but they’ll need the full day test to determine that. They are higher waisted but not ridiculously so – these hit right below my navel. I’d probably wear tees untucked with them so I’m not terribly worried about tucking shirts in. I have the lookout highrise jeans from J.Crew as well and these feel lower and not as restrictive as those do. You can see how far they go up on my waist. I like these a lot because I don’t have the gap that I get in a lot of jeans at my waist. And the flare isn’t too much of a flare. I tried them on with chunky heels to see how they’d look with heels, and I’ll probably try them with a thin heel ankle strap sandal too. I’m also tried the J.Crew Short Sleeve Popover Shirt in Oxford Blue in a tall length as well – I have the white and striped versions from last year which I have in a size 12 and wore the striped often with white jeans and the white with my lighter distressed jeans. I wanted to try the size 10 tall for more length. Meh. Untucked this shirt kinda felt like a hospital gown of some sort. I liked it more folded under as if I were going to tuck it in but I’ll probably exchange for a regular length. So, what do you think? Have you tried these jeans at all? Love or not so much? Stay tuned, I have several more reviews coming, including some dresses from Factory for spring. Would love to hear what you think and thanks for visiting!